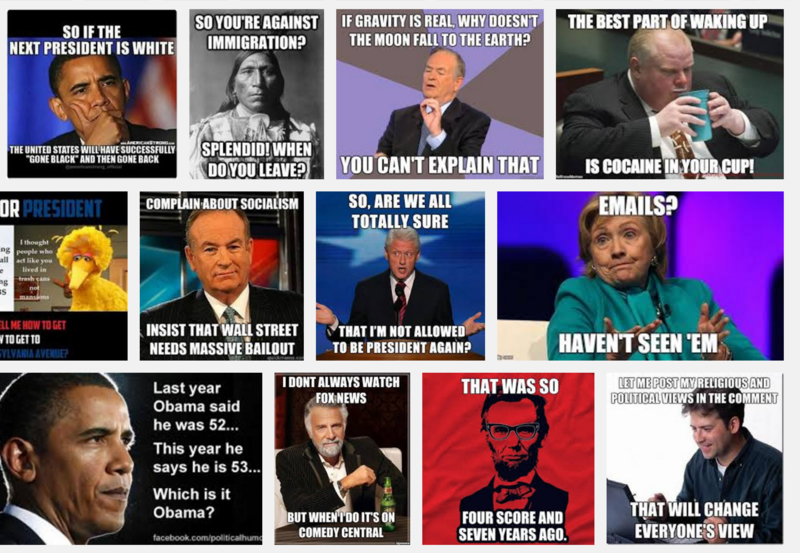 A Google image search on terms like “political memes” or “election memes” provides a reading experience markedly different than opening the morning paper. This instant, biased, collage of pictures is the most complex of digital footprints, still new to even the most web literate among us. Political memes show participatory culture’s take on political news and the evolving process of electing a president. For those of us interested in literacy education and connected learning, for CLMOOC participants in particular, when we see these memes, or .gif looping videos of candidates in our Facebook feeds and Twitter streams, we can plainly see that this presidential election cycle is an international make cycle already in progress. How can the #clmooc community join this stream in the interest of our own connected learning? The American presidential election has raised question about the shifting role of media and the web on contemporary politics. The emergence of Donald Trump, a controversial real estate billionaire and reality television star, as the frontrunner for the Republican nomination, prompts the mainstream print and television media to collectively ask “What’s happening?” almost daily, while Twitter feuds between candidates dominate the headlines the news organizations write. On the Democratic side, Bernie Sanders, a self-proclaimed democratic socialist and long-time independent congressman from Vermont, has proven himself surprisingly competitive despite eschewing campaign finance support from Super PAC’s. The social media campaigns of all candidates, these two outsiders in particular, are the subject of great interest. In just the last few days, both Forbes and the Economist have each published an analysis. Undoubtedly, the web and informal social channels are changing the way people keep informed about politics, and also how they discuss issues, events and candidates. Amidst this shifting media landscape, we invite you to join this make cycle that is already underway. Your facilitators for this pop-up make cycle, Terry Elliott (https://twitter.com/telliowkuwp) and Joe Dillon (https://twitter.com/onewheeljoe), will create memes and use them to annotate the political articles that whiz by, putting our creations in the digital margins (example above). We invite you to join us to learn with us by making your own political statements. If American presidential politics is a turn off, maybe you have something to say about the Flint water crisis. Maybe you’ll be following the planned walkout in Chicago’s Public Schools to protest school funding. Whatever your interest, we invite you to follow it and to make political statements with us. One of the best ways to get started is to find an automatic meme generating site imgflip.com, or memegenerator.net. The idea is to make and share until you have the hang of it. You can look at the many examples on these sites. Memes, like any viral digital thing, are hard to start so quite often you build on what others have already viralized. Like the Batman-slapping-Robin meme below. If you have a creation you’re particularly proud of, or if you want to share how you’re making memes, put your examples in the #clmooc Make Bank. For the uninitiated, this article explains in simple terms why people create memes. For the most web saavy among us, Indiana University’s Meme Diffusion project is a study of the way memes spread on social media. 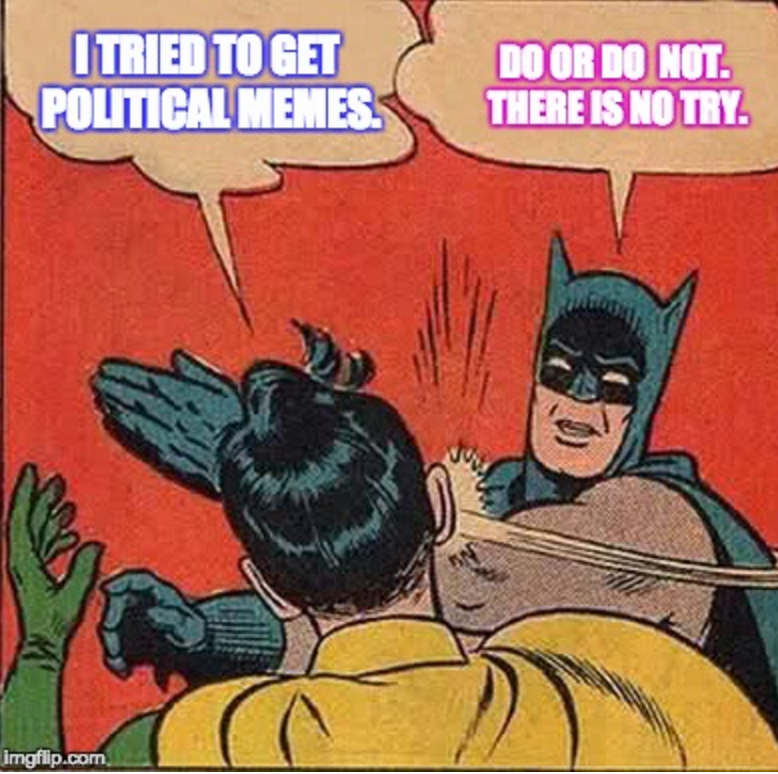 Memes aren’t new to the web or to #clmooc. If you’re unsure of what to meme, I would encourage you to check out the newsletter that launched the memes make cycle in 2014. It has all kinds of resources and helpful background reading. The #clmooc Google Plus Community responses to memes in 2014 will also help you pick up where our participants left off. You can scroll through for inspiration. The social annotation tool hypothes.is will allow us to use our political statements to respond to what we read and to create a layer of creative commentary. 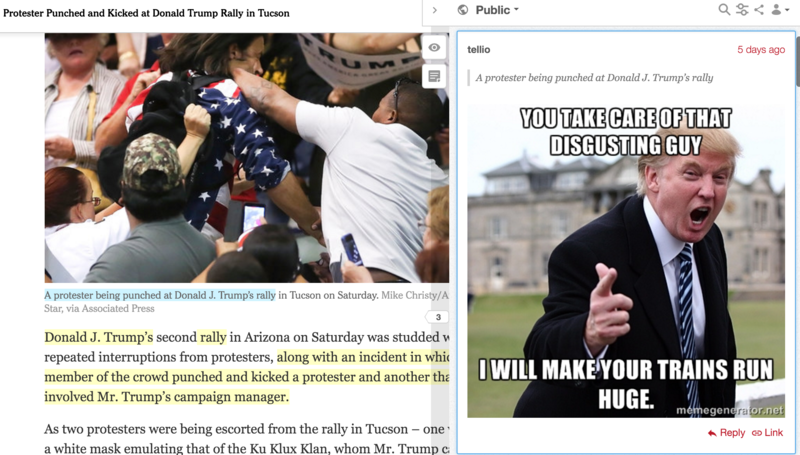 We can put our memes in the margins of the news this week. The hypothes.is quick start guide for students will guide you through set up and have you annotating online in minutes. Be sure to use the #clmooc hashtag on your annotations. For educators interested in using hypothes.is with students, here’s a comprehensive education page. The texts we annotate are really up to our community. We can gather them here in this Google Doc. All types of texts and political slants are welcome. If you add a text, consider tweeting out that you’ve done so. As always, any contribution to our make cycles are welcome, timely contributions. This pop-up experiment brings with it no requirements or due dates, no grades or course credits, just a chance to make meaning of a shifting political climate while it is shifting. Any digital footprint we leave on the #clmooc hashtag, the hypothes.is stream, and our G+ community will be a distributed political text of its own and a rich example of connected learning. Whether you throw a pebble in this stream, or roll up your pant legs, jump in and wade around, we welcome you, your voice and your creative contributions!